Pacific NorthWest Computers: New Virus Alert: CryptoLocker! CryptoLocker is a new, nasty piece of malicious software that is infecting computers around the world; encrypting important files and demanding a ransom to unlock them. If you get hit with this virus you risk having your personal data encrypted and lost for good! This sophisticated malware is delivered the old-fashioned way – an executable file hidden inside an attachment that looks like an ordinary ZIP file or PDF. One small business reports being compromised after clicking on an email attachment that was designed to look like a shipping invoice from the U.S. Postal Service. The CryptoLocker virus can be removed from an infected system, but unfortunately at this time there is no way to retrieve the private key that can be used to decrypt your files without paying the ransom. Brute forcing the decryption key is not realistic due to the length of time required to break the key. Also any decryption tools that have been released by various companies will not work with this infection. The only method you have of restoring your files is from a backup or Shadow Volume Copies if you have System Restore enabled. 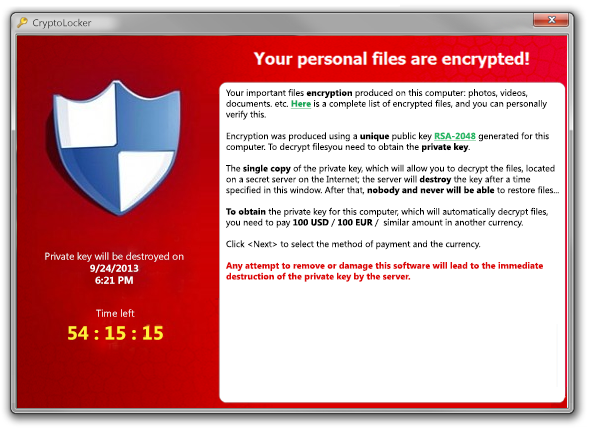 Newer variants of CryptoLocker attempt to delete the Shadow Copies, but it is not always successful. BACKUP ALL OF YOUR DATA ASAP! That’s the only way to reduce the risk of losing your files forever. Also, to avoid getting your backup's encrypted your backup device should be disconnected from your computer until the next time you need to access it or run a backup. Download and install a free utility called 'Crypto Prevent'. Crypto Prevent is a small utility that changes a few settings in your computer to help prevent the CryptoLocker infection from happening in the first place! Its not a golden bullet however, so having current data backups is your ulitimate defense. You can downloading the Crypto Prevent utility directly from the link below! If you need any assistance we can setup a visit to help secure and backup your computer for you! Let us know if you have any questions or issues!